From Vrindavan to Manipur - Places in India that celebrate Holi with full fervour. Holi is an ancient Hindu religious festival celebrated throughout India in the month of March. It is a celebration of good over evil, and the onset of summer all rolled into one. Legend goes that Holi also celebrates the immortal love of Krishna and Radha. People play with colours and flowers on this two day festival across India, and this year it falls on March 21-22. This is perhaps where Holi is celebrated with the most gusto and fervour in India. The celebrations here are for the advent of spring bidding goodbye to the harsh cold winter season. People especially come together at the famous Banks Bihari Temple and smear each other in different colours while dancing to the tunes of the religious hymns. 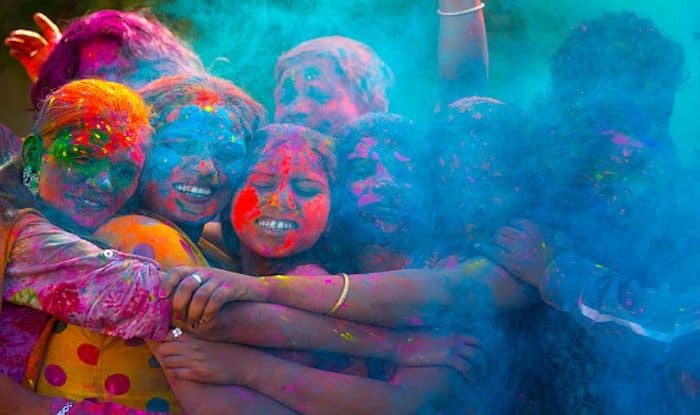 There’s a Phoolon wali Holi that happens where devotees are strewn with flowers by the temple priests and another unique celebration called the Widow’s Holi where the widows are encouraged to play with colours. A bizarre tradition is followed here during Holi; men are beaten up in jest with sticks by women, calling it the Lathmar Holi. However, it’s quite a sight to catch giggling women chasing men with sticks. Barsana is a small town near Mathura, and if you wish to experience the festival in its full glory, this is where you should head for sure. Commencing on the full moon day of Phalguna, Holi is celebrated along with the Yaoshang Festival of Manipur making it a six day festival. It is quite a cultural extravaganza to witness a number of folk dancers and musicians performing amid fluorescent lamps and bonfires, and people playing with gulal on the scene. In the stunning city of Udaipur, Holi is commenced with the burning of Holika at the central square outside Jagdish Temple, followed by music and dancing, joyous celebrations, bursting of firecrackers and more. The next morning, people step out on the streets and narrow bylanes of Udaipur with buckets of coloured water and water balloons. Locals and tourists participate in the revelry with great enthusiasm making Udaipur a great place to play Holi in India. The enthusiasm of the people of Jaipur coupled with the effort of Rajasthan Tourism makes it a fun experience to celebrate Holi in Jaipur. They organise a special event on the lawns of Khasa Kothi Hotel, especially for travellers. You need not be a guest of the hotel to be a part of the celebration. The event features Rajasthani folk dance, song performances, a festive lunch, and of course the customary play with colours.